Physics Teacher SOS workshop leader Dan Burns demonstrates how he uses stretched spandex lycra, weights, marbles, and gravity in his high school classes to make this impressive space-time warping demo. 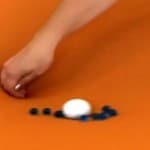 Filmed from afar, this general relativity explainer was made for other educators, but my kids were riveted by these tangible representations that include how our planets orbit the sun, how the moon orbits the Earth, and the free return trajectory used in the Apollo Program. Update: See how to set up this excellent demonstration in this Fabric of the Cosmos how-to video. File under: physics and education.